If you've read my blog for any length of time, you know I love to share with my readers about resources for children. I'm always looking for new books and resources to help my own children grow in their understanding of God and his word. And when I find them, I share them here. Today, I have two new books to tell you about. Here's a really good idea: let's teach our children that God created each of us in his image, whether we have straight hair or curly hair, light skin or dark skin, or whether we like reading or enjoy riding bikes. That's the premise of Trillia Newbell's new children's book, God's Very Good Idea. "We are all different, but we are also all the same. Everyone you see is different than you, and the same as you. They might look different or speak different or play different. But they are all made in God's image, and so they are all valuable." This picture book is gospel-centered, explaining to children how God made us to love him and love each other. But since the Fall, people ruined God's very good idea. Because of sin, we don't love God or each other as we should. We treat those who are different from us badly. We are hurtful and unkind. The book goes on to explain that God had a plan to rescue us through Jesus. He paid for our sin on the cross and gave us his Spirit to help us love him and love one another. One day, we will all be together in heaven, loving God and one another perfectly. The book ends by talking about the church, filled with people who are all different, who love Jesus. God's family is filled with people of every race and nationality, men and women, children and adults, people with every skill and talent imaginable. Let us teach our children about God's great idea. And let us love our brothers and sisters as Jesus has loved us. The past couple of years, I've been working with my children on the importance of being in the word—reading, studying, meditating, and memorizing it. I encourage them to read it on their own and we study it together in devotions and during homeschool. They've been learning to go through a passage and unpack it verse by verse. 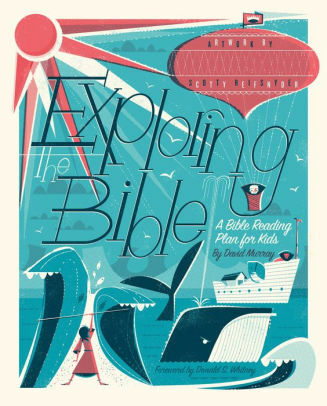 That's why I'm excited about David Murray's new book for children, Exploring the Bible. Exploring the Bible is a Bible study for kids and takes them on a journey through the Bible, highlighting the main parts and giving kids a big picture view of Scripture. There are 52 lessons in the book, for each week of the year. Every week there is a verse to memorize from the week's readings. Then each day of the week, there is a passage to read and a question to answer about it. On Sundays, they bring their book to church and use it to take notes on the sermon. Exploring the Bible gets kids in God's word on a daily basis and helps them begin the habit of reading and thinking through what they have read. At the end of the year, they will have a good overview of the Bible. A parent can sit with younger children and do the study along with them (for younger elementary students) and older elementary through middle school age students can do it on their own. I'm excited about this study for my children and if you've been looking for a way to help your children learn to study the Bible for themselves, this is an excellent introduction and a great way to build a lifelong habit of learning and growing from God's word. I highly recommend both of these new books to you and your children. Note: I received copies of these books for free in exchange for my review. The thoughts and opinions are my own. I am a member of the Amazon Affiliates program and links to books in this post are connected to my affiliates account with Amazon.com. For the last five years or so, my kids have taken Tae Kwon Do classes. After working hard at a sport for so long, it was exciting for all of us when they tested for black belt last month. The dojang where the test took place is a two story building. The students who were testing that day sat on the blue gym mats on the bottom floor while those watching the test gathered on the top floor where there was a railing overlooking down to the floor below. I leaned over the railing with all the other moms and dads and watched my kids demonstrate what they've learned these last five years. It took more than half an hour for them to go through all their forms. One after another, the group of twenty students stepped as one—kicking, slicing, jabbing, turning—doing the forms for each of the ten belts they had learned so far. They did so, following the instructions shouted out to them in Korean by one of the Masters. Tao Kwon Do, like other martial arts, is a method of self defense. They say that just taking one self defense class isn't enough to protect yourself in the case of an emergency. That's because when we are in a crisis, we revert back to what we know best. Our minds aren't thinking clearly as adrenaline mixed with fear courses through our bodies. It's only if you've taken self defense classes for years that you are likely to use it to defend yourself in an emergency. This is also why schools practice fire drills every month—we respond with what we know best when faced with a crisis. The same is true for us spiritually when we face a trial in our life. When a hardship or season of suffering comes upon us out of nowhere—when we are filled with anxiety, worry, fear, despair, and uncertainty—we respond to that trial with what our heart has practiced, what it knows best. Like rain water follows the crevices and paths already worn in the ground, our hearts will follow what we've studied and learned and meditated upon most. For believers, if we have not previously trained our hearts in God's word, if we have not studied and learned from Scripture about God's character, the how's and why's of trials in our lives, and the hope we have in Christ, our automatic response will not be to turn to those truths. We won't instinctively cling to the gospel. We won't turn to our Rock, Savior, and Deliverer; instead, we may panic. We might lay blame. We might turn to false comforts and counterfeit gods. We might lash out at others. In our most desperate moments of life, when we find ourselves unexpectedly faced with a crisis, our theology comes to the surface. What we really believe about God reveals itself out of the depths of our hearts. And in that moment, we discover if what we believe is firm enough to stand on or is a shifting sand that gives way to the next crashing wave. If you don't know whether your theology would stand in a moment of crisis, take the time today to read and study what God's word teaches about who God is, his character, his works, his redemptive purposes in our lives. Learn about the ways he works in the world, his sovereignty over all he has made, and his faithfulness to do all he has promised. Study his promises and his fulfillment of those promises in Christ. Read Paul's letters and learn about the process of sanctification, the Holy Spirit's work in our hearts, and the role of discipline and instruction in our sanctification. Study Jesus' life and see how he responded to suffering, hardship, and sorrow. And most of all, look to the cross and see how Immanuel, God made flesh, became the Suffering Servant, and defeated sin and death in our place. Like the forms my kids practiced over and over, we need to learn and study God's word until it becomes part of us. Until our heart moves in rhythm with it. Until we know it so well, in the case of an emergency, it's the truth that leads us to a place of safety—our Savior. I still remember the moment when I first glimpsed the Rocky Mountains. I was sixteen and joined a group of friends from my church on a journey from the east coast to Colorado. We drove for hours and hours from the suburbs of Washington, D.C., past cities and small towns, through the farms and plains of the Midwest (and strange features called buttes), until finally out of nowhere rocky peaks jutted out from the flat pasture that had been our roadside companion for what seemed like days on end. It was an extraordinary sight, like nothing I had seen before. The Appalachians were my only prior mountain experience and in comparison, the Appalachians were like gentle rolling hills. But we were still hours away. Even though the Rocky Mountains seemed so big and magnificent from our position on the road, we still had a long drive before we actually got there. Imagine if we had stopped at that point in our journey and said, "Well, we've seen the Rockies. Let turn around and head back." It would have been crazy. Sure, we saw the Rockies, but from a distance. We hadn't truly seen them. We hadn't been up close to see the jagged peaks. We hadn't walked its trails. We hadn't camped on its ground or smelled its flowers. We hadn't felt our lungs struggle for oxygen as we increased in altitude. To turn around at first glance and say we had seen the Rockies would have been like saying we had been to a state simply because we had flown to an airport in the state and made a connection there before going on our way. As crazy as that all sounds, we often respond that way to knowing God and his word. We step back and take in the big picture and think we know all there is to know. We are satisfied with merely a taste of who God is and then we think that's all we need. We are content with never going deeper and further in our knowledge of God. Like viewing the mountains from a distance, we learn a few things about him and then move on. On that trip to the Rockies we saw the mountains up close. We drove to the top and saw the view from 14,000 feet. We camped in Estes Park and hiked from the bottom to the top, experiencing each change in elevation and in ecology. We saw the wild flowers in the tundra and the marmots scamper across the rocky terrain. Then we saw the mountains from the bottom, in a river raft, as we moved swiftly through the canyon over swirling, foaming white water. At the end of that trip, I felt like I had truly experienced the Colorado Rockies. We can't say we've been somewhere if we've only viewed it from a distance. We can't say we are friends with someone if we've never spent time with them. We can't say that we love someone if we don't even know what matters to them. And we can't say that we know God if don't bother to be in his presence. If we don't take time to read what he has written to us and respond to it in prayer. If we don't taste and see that he is good. There is more to know of God than we could ever know in a lifetime. Even in eternity, we'll never plumb the depths of his magnificence. Even so, we shouldn't hold back on learning about him now. Paul prayed for the Ephesians, that they "may have strength to comprehend with all the saints what is the breadth and length and height and depth, and to know the love of Christ that surpasses knowledge, that you may be filled with all the fullness of God" (3:18-19). This ought to be our prayer as well. May we never be satisfied with just a cursory glance from afar, rather may we always yearn and seek to know the breadth, length, height, and depth of our Savior God.